how many bsa s do you own . Re: how many bsa s do you own . MK3 Super Meteor .22 - my father in laws, bought new when he was a lad in 1973 ish! Since it was my first gun I feel wierd moving away from BSA. //woowwww/// thas some collection Wryka well done. My very first rifle of my own was a meteor- bought when I'd just left school. I loved that rifle- but unfortunately it got stolen. Since then I've had a few bsa , all quality bar one absolute lemon. I 've got a bsa at the moment, a ultra mmc 177-uber accurate and reliable. Been there, seen that. Whats next? Just added a Mercury mk2, in .177, now up to 14!! You can't have too many BSA's!! The BSA first batch,Airsporter mk2, mk4, mk5,mk 6, Mercury mk1, mk2, mk3, Meteor mk1 mk2 mk3 mk4, mk5, mk6, Super-sport, Superstar, Lightning XL, Cadet, Cadet major, Breakdown , HW80, Logun S16, Webley Junior rifle, Webley mk1,Centre, Medalist. just the 2 for me. id love a hornet multi shot and a airsporter rb2! I've now got two. The Super Meteor Mk5 .177 (of that date), has been joined by a Meteor Mk5 .22. Its a second refurb/project gun, which I promise I'll take longer over this time - no 5 day turnaround with this one! 6 of the 7 dwarfs are not Happy! One......so far /sslaughhhh/ Lightning GRT XL SE .22 don't know if I want to try a PCP... lots of extra equipment to deal. I'm more of a purest. Beretta 9mm Cx4 Storm assault rifle. deemed illegal!! Never kill an innocent animal...only the guilty ones!! Just 2, ultra mmc multi in .22 and a scorpion t-10 in .22, thinking of getting a new ultra in .177. I'm female, I'm a Moderator.... LOL!!! R-10 in .22 just bought 2 days ago with a Leapers 6-24x50 scope (adequate scope, not so clear as day /sslaughhhh/) Shoots at around 30ft/lbs. I have a chronograph arriving tomorrow where I will do pellet tests and tweak settings for best results. I have 3 now, cadet major, superstar 22 and a lincoln jeffries 3rd batch, all shoot great. The wifey dont like my hobby, do I care??? Only got the three bsa's, .177 Model D, .22 Airsporter MK2 and a .177 Buccaneer. But the sporter is the only one working at the mo. Just the one.... 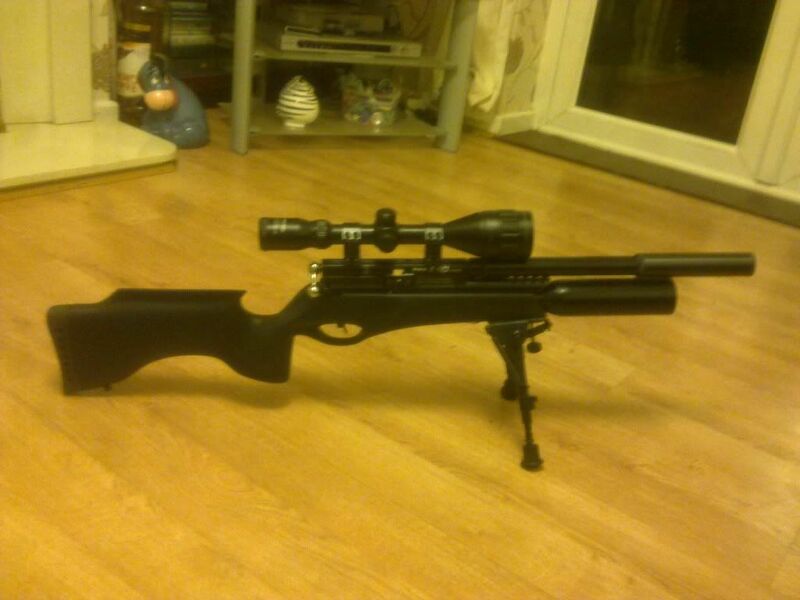 Lightning XL Tactical .22.... Just done a tune and fitted some stock mods.... Awesomely accurate weapon though the trigger could do with some work to make it lighter and crisper. stuck in the 70s - Life on Mars . Will your Insurance cover it ? BSA prewar Standard .22 ,Cadet Major .177 , Mercury Mk1 .22 I bought new , S.10 .177 , Ultra multi shot .22 , three Airsporters .22 vintage , Airsporter .177 mk 5 or 6, 2 old BSA Meteors .22 , 1 BSA super meteor mk 5 .22, .25 Supersport SFS tuned , .25 BSA supersport black tactical stock , .22 lightning carbine, I think there could be couple more lurking around that I cant remember ! Cos if YOU don't know, neither does the other half-- freedom to expand! I got a couple of Meteor 177 springers and a Lonestar 177 on the way. So just in the honeymoon phase of BSA ownership. do members of the daystate forum all own 5+ daystates . at £1000+ I kind of doubt it . do people generally collect other brands too . and a bsa s10 bbk in .22 which is going to be a bit of a project I feel.